This type of fishing technique is often used in areas where coral reefs are prevalent. It is a common technique carried out by the fisherman in South East Asia. This technique is devastating to the reefs and destroys any coral and sea life that may be held within the beauty of the coral sculptures. Muroami consists of nets that encircle the coral reefs. Pounding stones are used in a violent and destructive way. 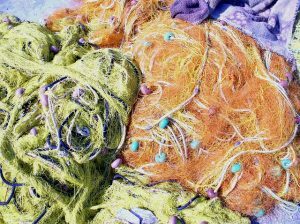 They are pounded into the reefs, destroying them, in a bid to scare the fish living within them, driving them into the nets. In some instances, cement blocks are hoisted up by cranes on shipping vessels. They are suspended above the sea and violently released. They smash into the reef, shattering them into nothing more than splinters. Coral reef encompasses many delicate ecosystems that feed off one another in order to survive. These amazing underwater castles take hundreds of years to form, and only a few blows of a cement block or stone to destroy. The method is one that does lead to success. Fish are driven into the encircling nets by the dozens. The costs, however, are high. Besides the destruction of the coral reefs and the habitats that lie within them, this kind of fishing is depleting populations at a tremendous rate. Sustainable fishing is certainly a term unused where this fishing method is involved. Muroami is the start of a chain effect that has no end. Muroami fishing is an illegal fishing technique that has catastrophic results for both the ocean and human life. In many instances, children are used to handling the large net. Many perish through becoming entangled in the nets and drowning. It appears that Muroami is a destructive, cruel practise that has far-reaching effects. While the fisherman achieves the desired results, everything else in the pathway suffers dire consequences.